The following information is offered as a starting point for a business person in their quest for information on protecting the intellectual property of their business. Readers of this page are cautioned to seek competent counsel before acting on any of the information presented on this page. As used on this page, intellectual property includes patents, trademarks, copyrights, and trade secrets. In today's competitive environment, business operators have two over-riding concerns with respect to intellectual property. First, how can the business profit from intellectual property? Second, how can the business minimize risk and exposure to lawsuits from others? Intellectual property, such as a patent, a trademark, a copyright, or a trade secret, is an asset. Unlike a building or a truck or office equipment, intellectual property is an intangible asset. Because of this intangible nature, intellectual property is not easily recognized as an asset or as having any value. One characteristic common to all intellectual property is that the owner has some power to prevent others from using it. For example, the owner of a patent can prevent others from making, using, offering to sell, selling, and/or importing the invention claimed in the patent. Likewise, the owner of a trademark, copyright, or trade secret has control of who uses the property. A competitive advantage is available to a business when others are restricted from using a business' intellectual property. Additionally, there may be profit in allowing others to use your intellectual property, for a fee. Many businesses consider license fees to be a valuable profit center. The first task of a business operator is to identify the intellectual property of the business. Patents and registered trademarks and copyrights are easy to identify because they are protected and have documentation to that effect. But, what about unprotected intellectual property? Identifying unprotected intellectual property is not always easy. What is it about your business that you do not want others to copy, access, or control? Perhaps you have a distinctive package that you do not want copied. Or, maybe you have a process or a product that gives your business an edge. Does your business print manuals, catalogs, web sites, or provide information to others? After such intellectual property is identified, the next step is to determine the cost-benefit of protecting that intellectual property. The costs to protect intellectual property include the fees to obtain the patent, trademark, and/or copyright. The fees to obtain a patent can be much more than those for registering a trademark. And the fees to register a copyright are almost insignificant for most businesses. The benefit of protecting intellectual property is not so easily determined, though. What is the expected annual revenue for the product with the invention? Will there be a difference in market share if others are prevented in copying the product? How competitive is the industry? Is there a marketing advantage to advertising patent pending or that a product is patented? Would potential investors consider a patent, a trademark, or a copyright a valuable asset, one worth investing in? Does the business need assets to use as collateral for loans? Whether a business protects its intellectual property is a business decision. It is a decision that should not be taken lightly, but the right decision can help the bottom line of the business. Intellectual property of others must be respected to minimize risk and exposure to lawsuits from others. For example, a patent owner can prevent others from making, using, selling, offering to sell, or importing a claimed invention for up to 20 years from the date of filing of the patent application. There is no requirement for a business operator to search for a patent, copyright, or trademark to ensure that there is no infringement issue. But, a prudent business owner will consider the risk involved before deciding not to search for potentially show-stopping intellectual property. Oftentimes, a business operator will have a very good idea as to what the competition is doing and what is protected within the industry. With respect to patents, answers to the following questions help form the basis of a decision as to whether a right-to-use or an infringement patent search should be conducted. Is the product being sold a copy of a product sold by another company? Are competing products marked with a patent number? Have competing products been sold, unchanged, for 20 years or more? Many businesses rely upon blissful ignorance with respect to infringement of patents belonging to others. These businesses expect the patent owner to police and enforce their patent rights. These businesses continue operating until they receive either a Cease and Desist Letter or are made a party to a lawsuit. It is then that the business considers the impact on its operations and its options. 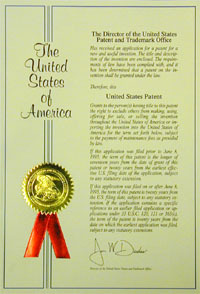 If a Cease and Desist Letter has been received, the possible options include discontinuing sales of the alleged infringing product, performing an infringement analysis to determine if the product is actually infringing, performing an invalidity analysis to determine if the patent is invalid and unenforceable, and negotiating a license. If the business has been sued by the patent owner, the options are more limited. The business can attempt to settle with the patent owner or proceed to fight the infringement suit. With both options, the business should perform an infringement analysis and should consider performing an invalidity analysis. These analyses will give the business some indication as to the strength of the patent and strength of the infringement suit. Disclaimer: The above information is offered as general information that may or may not be applicable to specific situations. The reader is cautioned to obtain the advice of a patent attorney before acting on the basis of the above information.